Astronaut Joe Acaba works on wire connections and other maintenance tasks inside Combustion Integrated Rack gear. The Expedition 54 crew aboard the International Space Station is training for this weekend’s departure of the SpaceX Dragon commercial cargo craft. The crew is also exploring regenerative life support systems and how microgravity affects breathing. NASA astronauts Joe Acaba and Scott Tingle began their day training and reviewing for Saturday’s remotely controlled release of the Dragon resupply ship at 5 a.m. The duo took onboard computer training and discussed this weekend’s activities with engineers at Mission Control. This is the first time robotics controllers will command the release of Dragon from the ground while Acaba and Tingle monitor from the cupola as backups. NASA TV will broadcast live the resupply ship’s departure starting Saturday at 4:30 a.m. Splashdown off the coast of California is expected at 10:36 a.m. and will not be televised. Experimental work also took place today on the orbital laboratory to help NASA learn how to support astronauts on longer missions farther out into space. Acaba checked bacteria cultures that could be used for carbon dioxide removal and oxygen production supporting future regenerative life support systems. Japanese astronaut Norishige Kanai joined NASA astronaut Mark Vande Hei and measured their breathing rates today, specifically Nitric Oxide turnover in the lungs. Doctors want to minimize the risk of airway inflammation to keep astronauts healthier farther from Earth. The SpaceX Dragon resupply ship with its dual outstretched solar arrays is pictured attached to the Harmony module as the International Space Station orbited above Brazil. 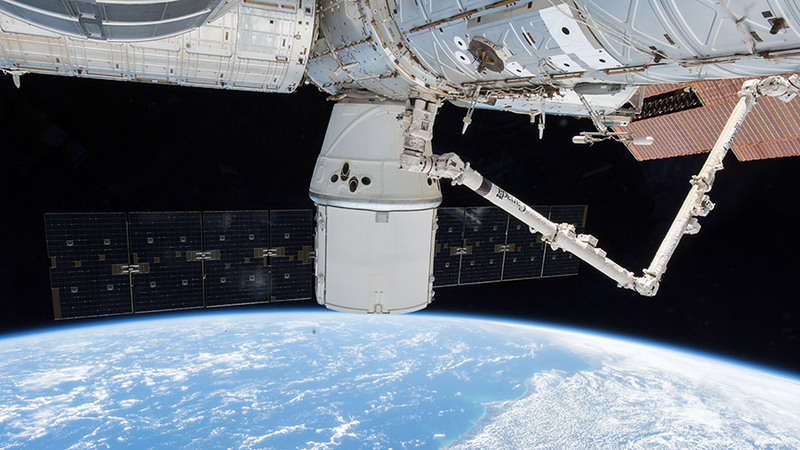 Robotics controllers are getting ready to uninstall the SpaceX Dragon cargo craft from the International Space Station on Friday before releasing it for a splashdown in the Pacific Ocean Saturday. The Expedition 54 crew today is also continuing to study how living in space affects biology and introducing space travel concepts to students on Earth. 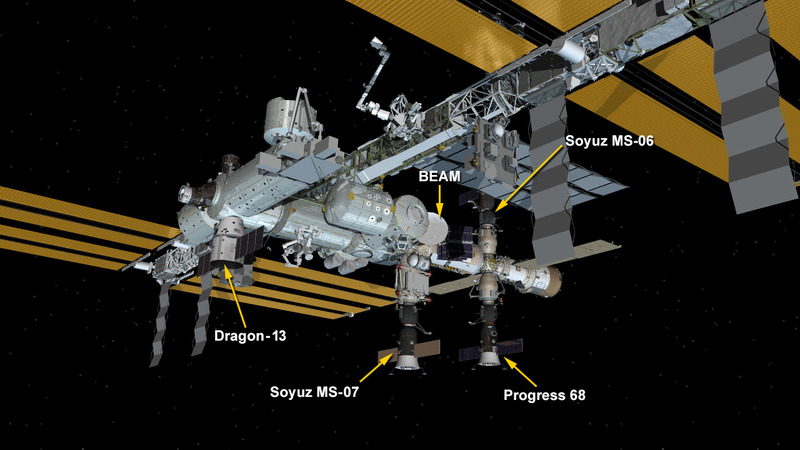 The crew is finishing packing up the Dragon this week and will close the spaceship’s hatch Friday and wrap up cargo operations. Houston mission controllers will remotely perform Dragon’s release operation for the first time early Saturday. Flight Engineers Joe Acaba and Scott Tingle will be inside the cupola monitoring Dragon’s departure. Dragon will be depart the station Saturday at 5 a.m. EST loaded with science experiments and station cargo and parachute to a splashdown off the coast of California at 10:36 a.m. NASA TV will broadcast live the resupply ship’s departure starting Saturday at 4:30 a.m.
Life science continues at full pace aboard the aboard orbital laboratory today. Japanese astronaut Norishige Kanai checked on rodents being treated with a compound that fights muscle loss in microgravity. Tingle took a look at plant samples to observe their genetic and molecular responses to growing in space. Commander Alexander Misurkin along with Acaba set up a pair of tiny internal satellites, also known as SPHERES, for a dry run today ahead of a competition. Students on Earth are competing to design the best algorithms that will operate the SPHERES to simulate future space operations such as dockings and flying formations. 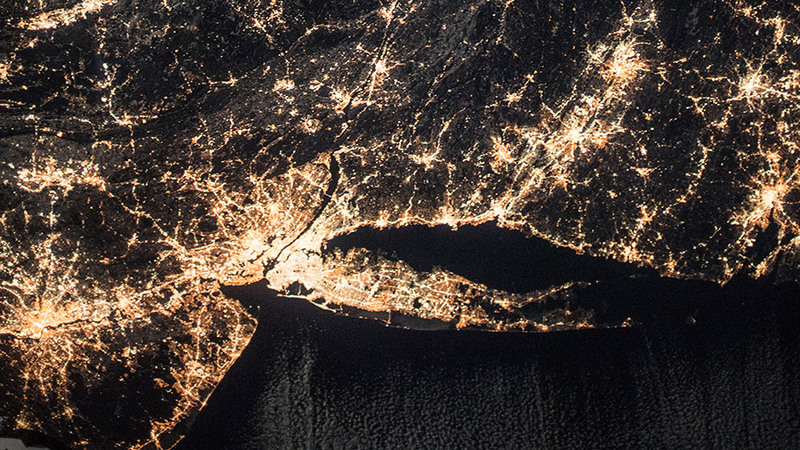 The well-lit coasts of New Jersey, New York and Connecticut are pictured in the wee hours of New Year’s Day. The Expedition 54 crew is starting the New Year studying how humans adapt to living in space for months and years at a time. NASA and its international partners are also learning how to support crews on longer missions with less help from the ground. 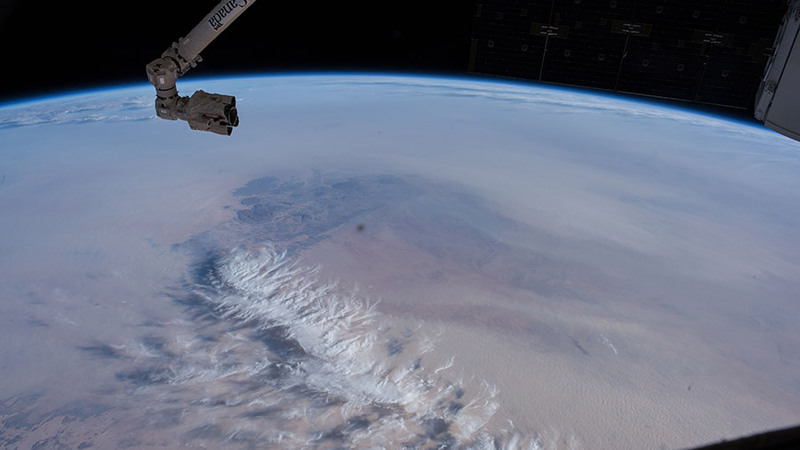 The astronauts and cosmonauts on the International Space Station orbit Earth 16 times a day affecting their circadian rhythms, or biological clocks. Japanese astronaut Norishige Kanai is helping doctors understand how being away from the normal 24-hour sunrise-sunset cycle impacts the human body. He strapped on sensors today that will measure his body composition and temperature for 36 hours. 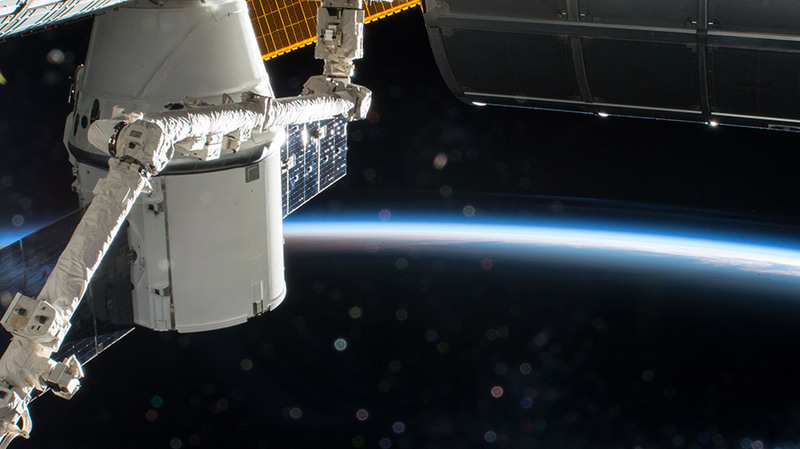 NASA astronaut Mark Vande Hei is helping engineers design closed-loop systems keeping crews self-sufficient on longer missions beyond low-Earth orbit. He swapped experimental containers in the Biolab Incubator containing bacteria cultures that could be used for carbon dioxide removal and oxygen production. Crews also need to be prepared for bone injuries or dental work that may be necessary during a space mission. The Synthetic Bone experiment, that Flight Engineer Joe Acaba worked on today with Kanai, is testing how a synthetic material integrates with bone cells to address bone fractures and bone loss in space and on Earth. 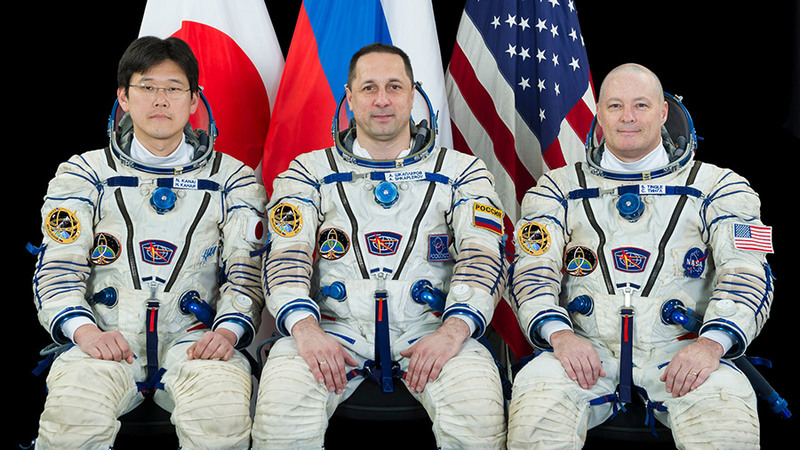 Expedition 54-55 prime crew members (from left) Norishige Kanai of the Japan Aerospace Exploration Agency, Anton Shkaplerov of Roscosmos and Scott Tingle of NASA. The International Space Station’s three newest crew members are beginning their second week familiarizing themselves with the orbital lab’s operations and systems. They and the other three Expedition 54 crew mates are also busy today with cargo operations, space science and station maintenance. Also, a Russian cargo craft is departing the station tonight after a six-and-a-half month stay docked to the Zvezda service module. The Progress 67 cargo craft will undock from Zvezda tonight at 8:03 p.m. EST then re-enter Earth’s atmosphere to burn up over the south Pacific Ocean. Veteran cosmonaut Anton Shkaplerov and first-time astronauts Scott Tingle of NASA and Norishige Kanai of JAXA are in their second week in Earth orbit and getting used to life in space. The new space residents, who arrived Dec. 19, have time set aside in their schedules to adjust to life and work in weightlessness. Two-time station resident Joe Acaba from NASA worked throughout Wednesday gathering items for stowage inside the SpaceX Dragon resupply ship. Kanai assisted Acaba with the pre-packing duties readying the cargo for return to Earth inside Dragon on Jan. 13. Tingle strapped himself into an exercise bike this morning breathing into a tube for a study measuring physical exertion in microgravity. In this long-running experiment, doctors are researching ways to ensure astronauts stay fit and healthy in space to maintain mission success. 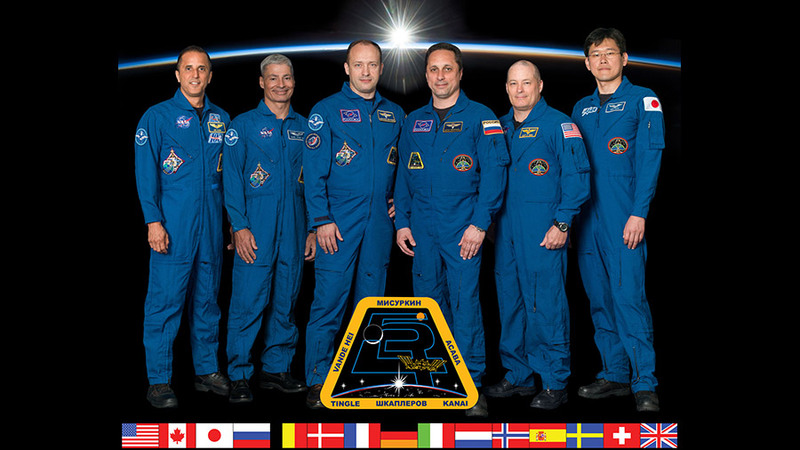 The Expedition 54 crew members (from left) are NASA astronauts Joe Acaba and Mark Vande Hei, Roscosmos cosmonauts Alexander Misurkin and Anton Shkaplerov, NASA astronaut Scott Tingle and JAXA astronaut Norishige Kanai. Six Expedition 54 crew members will spend Christmas orbiting Earth sharing a traditional meal and opening goodies delivered on recent cargo missions to the International Space Station. Veteran crew member Anton Shkaplerov of Roscosmos is spending his third holiday season in space. Meanwhile, advanced space science is taking place seven days a week on the orbital lab as the astronauts explore a variety of phenomena that can only be revealed in the microgravity environment. Human research is especially important as doctors learn how to keep space travelers healthy and strong during spaceflight. The station’s newest Flight Engineers, Scott Tingle of NASA and Norishige Kanai of JAXA, collected and stored their blood samples this morning for the Cell-Free Epigenome experiment. The samples will be analyzed later on the ground for cellular changes that take place in crew members while living in space. 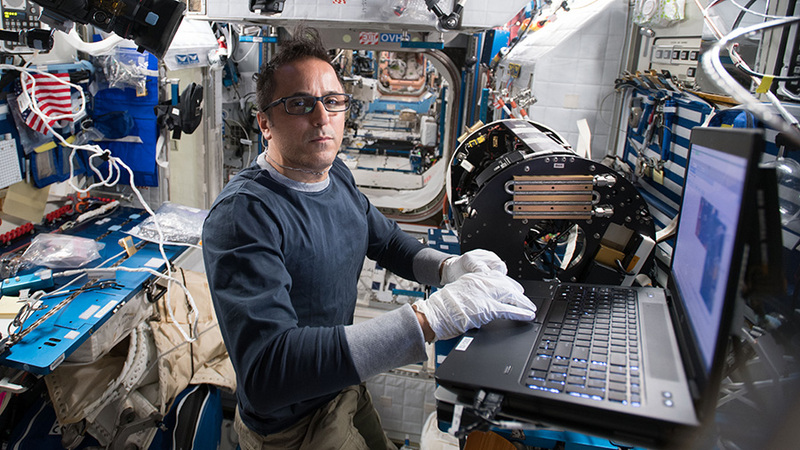 Astronaut Joe Acaba of NASA is testing new research hardware today for its ability to maintain cell cultures and enable cellular experiment work. Acaba swapped out gear inside the Bioculture System that is being validated as a long-term biological research facility. 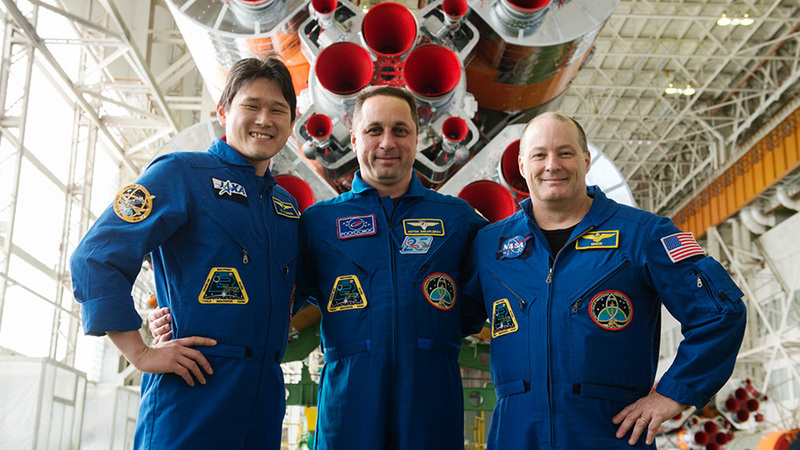 Expedition 54 crew members (from left) Norishige Kanai, Anton Shkaplerov and Scott Tingle pose in front of the Soyuz MS-07 spacecraft that would launch them into a space a few days later. 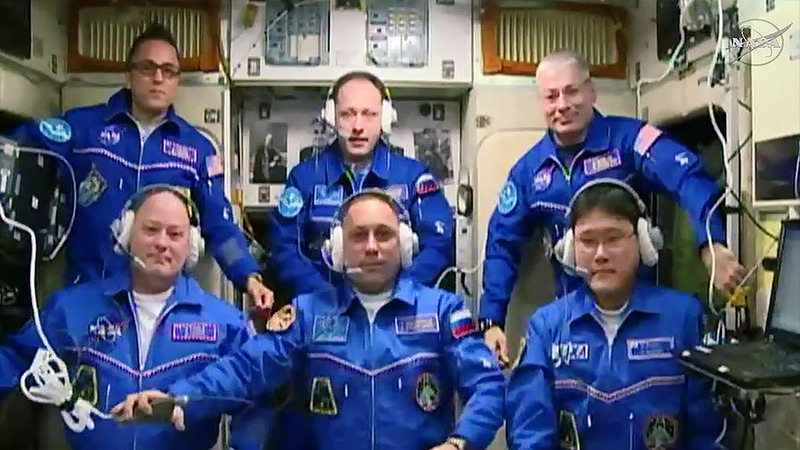 Aboard the space station, Expedition 54 Commander Alexander Misurkin of Roscosmos and his crewmates, Mark Vande Hei and Joe Acaba of NASA, will welcome the new crew members when the hatches between the two spacecraft are opened following standard pressurization and leak checks. Watch the hatch opening targeted for 5:35 a.m. and welcome ceremony to follow live on NASA TV beginning at 5 a.m. on the agency’s website. For live coverage and more information about the mission, visit: www.nasa.gov/station. Get breaking news, images and features from the station on Instagram at: @iss and on Twitter @Space_Station and @ISS_Research.